On this project, the demolition plan called for a partial demolition of a 16 story reinforced concrete hospital, while leaving the remaining half intact. Structural & Demolition Analysis included analysis of seismic ground vibration to protect surrounding infrastructure and property. The Perna Seca Hospital is considered to be the first reinforced concrete building constructed in Rio Di Janeiro, Brazil. The structure is composed of 3 wings, each 16-stories tall, totaling more than 25,000m2. When built, the owner decided to use only half of the structure due to financial reasons. The remainder was left unused and over time the unused half suffered deterioration and became unsafe to patients and employees working in the occupied portion of the hospital. This forced the owner to demolish the unused section. Safely demolishing only half of a structure presented several challenges to the implosion team, Fábio Bruno Construções, as it was required leaving the other half undamaged. Fábio Bruno Construções proposed a demolition plan that included the manual demolition of a 15m section of the building. This roughly divided the structure in half to allow the implosion of the deteriorated half of the structure away from the occupied portion. To ensure the safety of the remaining structure and other surrounding buildings, Fábio Bruno Construções tasked Applied Science International (ASI) to analyze the demolition plan. ASI has used their proprietary Extreme Loading® Technology (ELT) to model and analyze the behavior of the structure during the proposed demolition. ASI modeled every structural detail in 3D which included columns, beams, slabs, masonry walls, expansion joints, and the components corresponding reinforcement detail. The model also included weakened material models in corroded areas of the structure to reflect real-world conditions. The demolition team, through ASI’s analysis, was able to safely demolish one half of the structure without damage to the other portion of the building or other mishaps that can occur during a demolition. 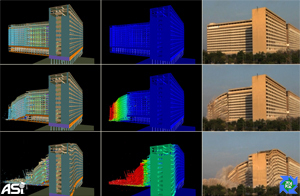 Due to the sensitivity of the adjacent buildings and hospital equipment, ASI simulated soil vibration effects from the demolition of debris impact. This was important as high velocity impact from building debris on varying soil composition can be hazardous to surrounding infrastructure both above and below ground. Through this analysis all ground acceleration levels from impacting debris were determined to be within acceptable limits.